Deep River Connecticut Propane Delivery. Best Prices, Fast & Reliable Fuel Delivery Services. 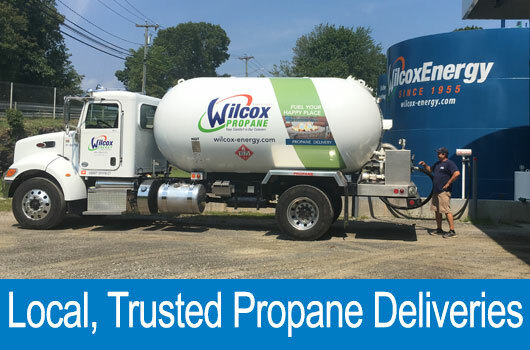 Wilcox Energy is proud to offer propane delivery services to residential and commercial properties right here in Deep River, Connecticut. We are not a propane company, we are a customer service company. Our focus is all about our customers! The fuel delivery drivers at Wilcox Energy have what it takes to fulfill all of your propane needs. If your home or office requires propane delivery, an emergency service, or new propane tank installation in Deep River, CT 06417, be sure to give us a call. Our experts have the knowledge required to keep your home or business warm and cozy throughout the cold season. Is your propane tank running dangerously low? Are you worried that you might not make it through the night? Wilcox Energy offers reliable and trusted propane delivery to homes and businesses throughout Deep River, CT. Don’t deal with a cold night. In these situations, you want to get reliable propane delivery from a Deep River, CT propane company you can trust! Call Wilcox Energy for fast propane delivery. Wilcox can help homeowners and business owners in situations like these because we have a storage depot. This means that we have ample supplies to keep you warm. Also, we have a small coverage area, which includes Deep River CT. We only service 20 miles from our office. So, not only do we have the propane that you need but we will deliver it quickly since we are close by. Wilcox Energy is located on the southern shores of Connecticut with service locations in Deep River. We have not extended our service location because we are proud to be known for providing fast Propane Deliveries and Home Heating Oil Deliveries. Our customers can take advantage of our 24 hour emergency services when their tank is running low. We are more than just a fuel delivery company. We also offer HVAC services. When your system needs maintenance, repair or a tune-up, be sure to give us a call. We also can install or replace HVAC systems. For homes that use propane, we can service your propane water heating system, fireplace, or pool heating system. Is your air conditioner acting up? Propane homeowners can give us a call to service their AC systems. Wilcox Energy, a full service HVAC company, can get your unit running and your Deep River, CT home cool in no time. We offer repairs, maintenance, installations, and repair services. Looking for a propane delivery company can be challenging. This is especially true when there are so many options available. How do you choose? You only want the best so you will certainly need the most professional, friendly and knowledgeable company available. Be sure to contact us. We only hire those that exhibit strong customer service skills, experience, and expertise in the field. Propane prices vary from one day to the next. This is because propane prices are determined by factors such as supply and demand, crude oil, weather, and much more. In order to find the best propane prices available in Deep River, CT, call (860) 399-6218. Deep River, is a small town located in Middlesex County Connecticut. It borders Chester and Essex, in what people refer to as the “Tri-town area”. Deep River was formerly part of the Saybrook Colony which joined the state in 1644. Chester broke off in 1836 from the Saybrook Colony and formed its own town, and Deep River followed suit in 1947 becoming its own town. Lyme, East Lyme, Old Lyme, Chester, Westbrook, Essex, and Old Saybrook all broke off from the original Saybrook Colony. During the mid 1800’s to about 1940, Deep River was one of the biggest ivory importers in the world. The ivory trade helped create massive amounts of wealth in the area. The median household income for Deep River is just over the Connecticut average ($72,346) at $72,946. Compared to fifteen years ago, the wages have increased steadily considering it was only $51,677. Home values on average in the year 2000 were around $162,900. Today those median home values are upwards of $281,000. The median age of residents is 44 years old, which is slightly above the average for Connecticut and the country.